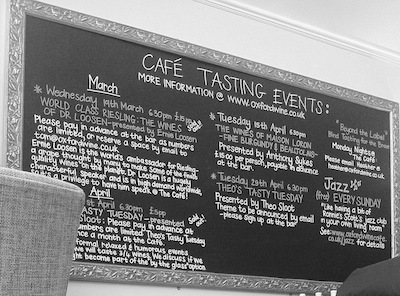 The Oxford Wine Cafe hosts a variety of tasting events each month… Always relaxed, informative and full of wines to get excited about. Luckily for me they hold a monthly wine tasting event that costs all of £5 a ticket, run by a member of their staff, the unmistakable Theo Sloot. If you’re wondering what renders this gentleman unmistakable, check out his handlebar moustache in the photo, it is a thing of beauty and I for one am humbled in its presence. Each of these tastings are built around a theme of sorts and the purpose of this evenings tasting was to showcase some of their newer wines from the Loire Valley in northern France. The Loire is famous for producing mineral-tastic Sauvignon Blanc that is the exact opposite of the kiwi ‘Marlborough’ style of the wine. In other words they’re typically subtle, elegant and completely devoid of ‘Hedge’. Even if you’re unfamiliar with the name of the region you may recognise some of famous wine growing areas… such as Sancerre, Pouilly-Fumé & Touraine. What’s less known about the Loire is they produce a sizeable amount of red wine from Pinot Noir & Cabernet Franc as well as some incredible whites made with Chenin Blanc. The French pride themselves on crafting wines that express the character and nature of the ground the vines grew on; hoping to make wines unique to each vineyard; unique to every diverse plot of land. Most of the time it has more to do with the attitude of the wine makers than any noticeable element to wine itself, though there are a few exceptions and wines from the Loire are defiantly one of them… as this tasting would show. 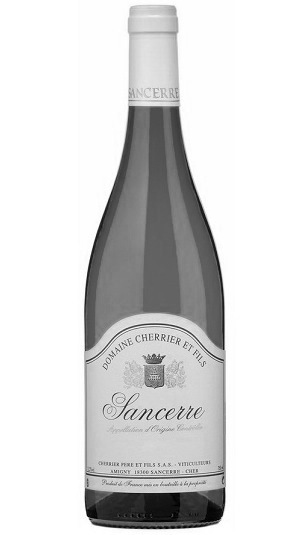 Classic Sancerre… lime, gooseberry and blackcurrant sherbet, NOM! The first wine up was a classic Sauvignon Blanc from Sancerre, which provided us with a familiar jumping off point for the region. Pale yellow colour with lime hints to it and clean fresh aromas of pure gooseberry and blackcurrant sherbet, with a vein of minerality winding through. No ‘hedge’ or stinging nettles in sight! Clean Gooseberry and apple fruit attack the pallet with perfectly balanced acidity and a light fresh body to the wine, which fades leaving a clean fresh mineral finish. 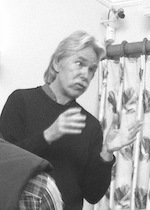 It’s typical of Sancerre and typical of Sauvignon Blanc from the Loire in general. The important character to note here, in terms of the evenings theme, was the distinct minerality the wine possessed, deriving mostly from the limestone soils so typical of the region. Describing minerality in a wine is a tricky task to accomplish and in the case of this wine it was on the subtle side and closer to a wet stone aroma. See what I mean… how many wet stones have you sniffed? It’s just not the sort of thing most of us go around doing! Other potential characteristics in wine are far more familiar to us; we understand the basic concept of fruits, flowers, herbs and woody aromas, even if we don’t have a specific point of reference for the particular ones we’re smelling or tasting. Minerals on the other hand we tend to ignore unless we’re studying Geography or happen to trip and face plant the asphalt; either way an unhappy experience for all concerned. But have you ever been outside on a hot summers day when one of those odd spells of rain appear out of nowhere? Because there’s a distinct smell in the air when that rain hits the road and kicks up all that warm stone and earthy dust… that’s minerality in a nutshell. The next time you’re caught out in a spell of summer rain, take the time to stop for a moment see if you notice what I’m talking about, because once you do the mineral qualities of a wine will start to jump out at you. Don’t be put off by the ‘Demi-Sec’ label… this wine’s perfectly balanced and the extra sugar serves to enhance rather than dominate. The second wine of the evening was a Demi-Dec (off-dry) Chenin Blanc from Vouvray. Pale yellow colour with more of a golden tinge to it than the Sancerre above and aromas of, well… wet chalk. Lemons on the pallet and medium bodied, it has an off dry sweetness with a sherbet acidity providing a backbone to counter the increase in sugar, resulting in a deceptively balanced wine with a leisurely mineral finish. If your looking for a wine that embodies the French need to make wines that express their terrain, their ‘terroir’… this is it. The closest analogy I can come up with is this smells, tastes and feels like one of those lemon glucose energy tablets; not by any means a bad thing, but not what most will be used to encountering from a wine! It is undeniably well made, but like all wines that highlight a single aspect so strongly, let alone an aspect like minerality, it will divide opinion. So not everyone’s cup of tea, but it was a fascinating case in point and the perfect keystone to understanding the minerality that runs through wines from the Loire. French Malbec doesn’t have the best of track records, but this is one they can be proud of. Malbec, believe it or not, is a French grape and not native to Argentina at all. Though Argentinians are justifiably proud of their success with the grape variety, the French have had a more humbling experience with it of late; even going so far as to seek advise from the Argentines on crafting wines from their own grape variety. There are good examples of French Malbec (or Côt/Auxerrois as it is sometimes called), to be found and some of the best are from ‘Cahors’ in the southwest and ‘Touraine’ in the Loire. However, to say that I was pleasantly surprised by how good this wine was would be an understatement. Bright vivid purple in colour with aromas of smoky plum, cedar box, leather and tobacco leaf… a hint or two of savoury bell pepper to boot. Full bodied with intense blackberry and black cherry fruit on the pallet and a good acidity to match, leading to a long cigar like finish. There is minerality present but here it’s far subtler than even the Sancerre and provides a good foil for the tannin present in the wine. I may have loved this wine but others were thrown but how different it was to the Argentinian style of Malbec that most of us are used to. It is a different animal entirely and closer by far to something like a Rioja, minus the vanilla and buttery characteristics they have. That said, try this wine on it own merits and I think you’ll be surprised by how rewarding and complex it is for the price. You don’t even need to tell your friends it’s Malbec, just pour them a glass and see if they like it… then tell them it’s Malbec from France and watch the look on their faces! Loire Cabernet Franc is a unique beast… one for the adventurous. 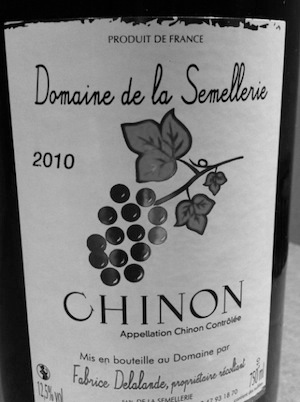 Rounding out the evening we finished on this Cabernet Franc from Chinon and if you’ve never tried a straight Cabernet Franc from France, you may be surprised at how distinct an identity it has compared to other red grape varieties. Cabernet Franc is famous for it’s graphite/pencil lead characteristic that’s so favoured by Chateau in Bordeaux. 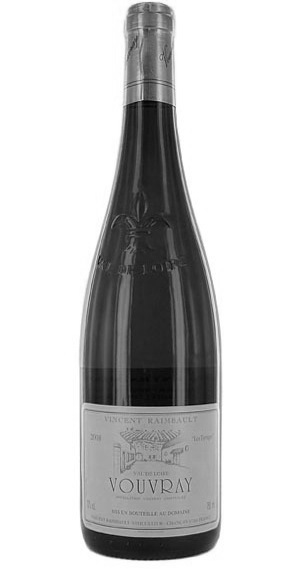 So imagine combining the chalky limestone characteristics of wines from the Loire, with the graphite character of Cabernet Franc and you get something similar to licking the inside of a pencil case… in a good way (honest!). 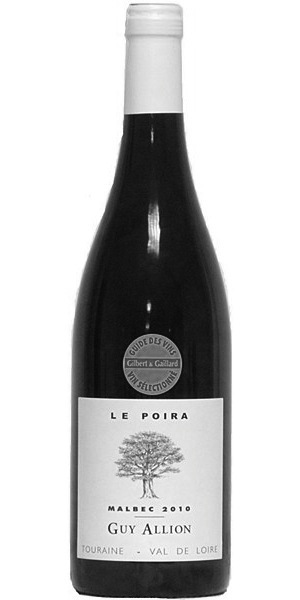 It has a bright, almost luminous red colour and vivid aromas of cherry, chalk and graphite. The acidity is tight and powers the concentrated burst of cherry fruit that attacks the pallet before fading to a chalky but mouth-watering finish. As with most wines from the Loire in the current wine market, this will not be to everyone taste. It is, however, like the other wines tasted during the evening, a well crafted and value for money example of a Loire wine. Tastes after all come and go, and for the most part wine makers in the Loire are sticking to their guns, and I applaud them for it. It wasn’t to long ago (looking at the history of wine) that wines from Bordeaux were seen as a joke and those from the Loire hailed as the ideal. Who’s to say those days won’t roll around again. Please let me know what you thought and thank you for reading.